"I loved absolutely every minute of my course and wish I could do it all again. I'm always recommending Broomfield to our dog walkers, who are young and keen to get into animal care." For former Derby College student Annie Dowell getting a job working with animals was inevitable. And, thanks in part to the practical work experience and the qualifications she gained on her Animal Care level 3 course; she now runs a boarding kennels. Annie first got to know Coppice Kennels and Cattery in Melbourne while at Derby College and later took a Saturday job there as a dog walker. After leaving College with a triple distinction she went on to take a dog grooming course at Broomfield and then worked at dog re-homing centres in Wales and Spain. In 2012 she took over the running of Coppice Kennels and is now responsible, with fiancé Matt for looking after 40 dogs, 15 cats as well as up to five foster dogs. 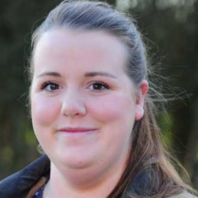 Annie loved her time at College – especially the caring for wildlife part and gaining work experience at Twycross Zoo. Find out about studying Animal Care at Derby College.